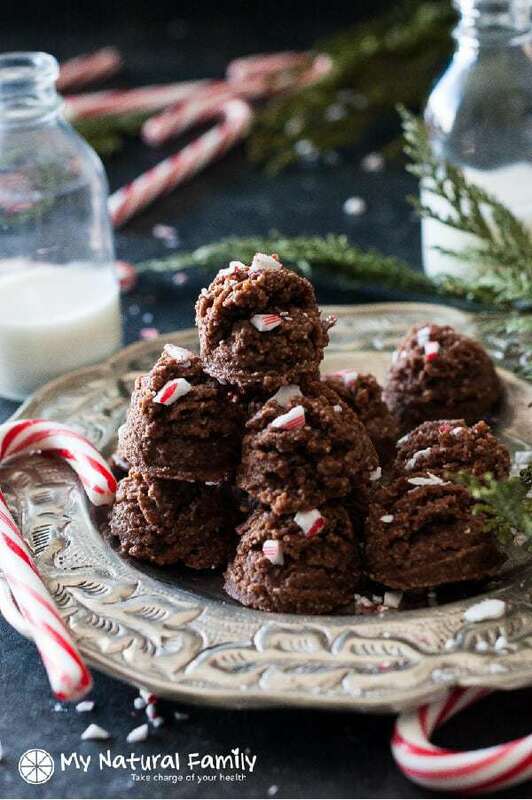 This Chocolate Peppermint paleo macaroons Christmas Cookies Recipe is possibly my favorite cookie ever. They are great for kids to make because there is no cooking involved. I actually had a hard time saving enough to shoot pictures of because we couldn’t stop eating them. 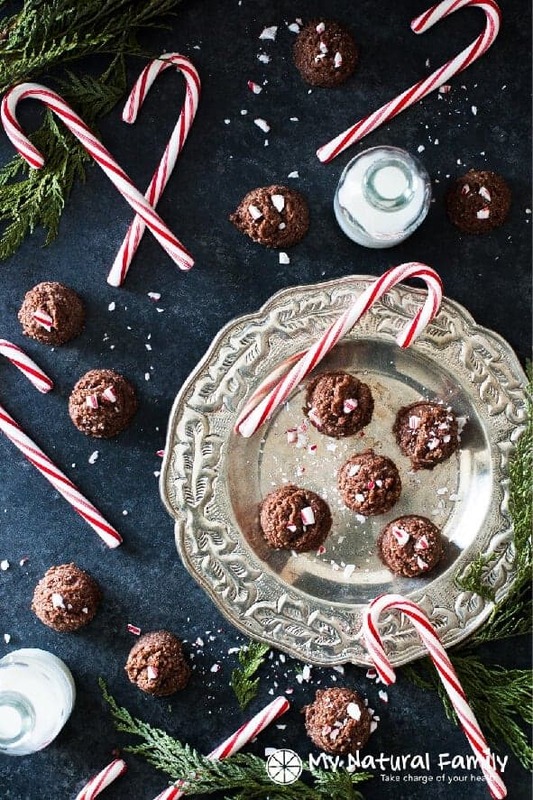 They are raw, vegan, gluten free, dairy free, refined sugar-free, and Paleo – when the crushed candy canes are left out. They have peppermint oil, so really, the candy canes are just for show. We ate ours without the candy canes. 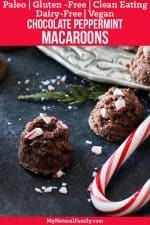 These paleo macaroons are simple to make and don’t have to be cooked and can be put in the fridge for an hour and be ready. Alternatively, you can dehydrate the cookies at a low temp (around 105 degrees) in a dehydrator for 12-16 hours. These paleo macaroons are great for parties or for giving to neighbors. They are festive and have a lot of great flavors. This is the kind of recipe that is great for my daughter to make because she can make them without me having to worry about using heat and burning herself. She can also have her younger siblings make these with her and then share with others at a party or gathering. My children all love making things and giving them to family and friends. It is one of their favorite things to do, including hand-drawn pictures. They do so many we have pictures all over our house. 🙂 This year my 11-year-old daughter is making little clay nativity scenes for each family at our family Christmas party this year. She pretty much spends her life in her room with her door shut working on crafts. What are some of the cute things you have seen children do? What thoughtful things do they do for others? Share below! I think that we can learn a lot from children and their kindness. These only have 7 ingredients and are raw, so you can whip them in no time! Place the shredded coconut in a high speed blender, like a Vitamix. Turn the blender on to the lowest setting and process the coconut for a few minutes, until it starts to turn into coconut butter. There should still be pieces of shredded coconut, but the mass should start to be turning into a ‘nut’ butter consistancy. Add the remaining ingredients and process just until combined. Over-blending will cause the dough to become oily. 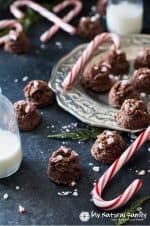 *If you aren’t concerned with the cookies being Paleo, add the crushed candy canes in at this point and mix in lightly. Use a scoop with about a 1 tablespoon capacity and scoop out rounds of dough onto a parchment lined baking sheet. Refrigerate cookies for 1 hour, or until set. These are really yummy. I used 6 tbs of maple syrup and drizzled on some melted chocolate before adding candy cane pieces. Yum. I’m so glad you liked them! Thanks for commenting. I made these for my family and they are amazing! So simple and sooo so good. Thank you! I’m so glad you like them. Yes. They really are simple and so good, if you like coconut. These look so much fun, I want to make them for Christmas this year.